If you’re looking to get a betta, the many tail types available can get pretty confusing. Pet store labeling is often incorrect, which can lead to confusion as well, leaving you wondering which type of betta you really got. If you’re trying to find out which tail types are available or if you’re trying to ID your current betta, keep reading for a list of the most common and more uncommon tail types! Note: Many of the bettas pictured are in small temporary holding containers that are not suitable permanent homes for them. Read why betta bowls are bad for more information about this. Veil tails (photo above! 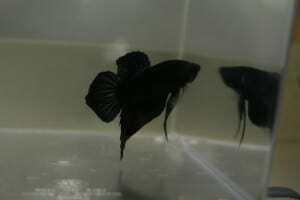 ), while actually a little underappreciated by betta breeders, are the most common betta tail type. If you encounter a betta at your local pet- or aquarium store, there’s a good chance it’s a veil tail! You can recognize this fin type from the long, colorful flowy tail that trails behind them like a veil. While the veil tail bettas you see at the store may not be the prettiest due to bad breeding and care, don’t be fooled by this! A well cared for veil tail from a responsible breeder can be a beautiful fish. Because veil tails can be weighed down by their long fins they will really benefit from a few extra resting places in the form of broad-leaved plants like Anubias. Like veil tails and any long finned betta, halfmoon bettas are easily tired out by contantly dragging their long fins around and adding plenty of plants to give them a place to rest may be a good idea. My personal favorite, plakat bettas are short finned bettas. They are available in any other tail type, which means a veil tail or halfmoon betta can also be a plakat if it’s bred to have short fins! Just be sure not to confuse female bettas with plakats, as they both have short fins and can look quite similar. Females can be recognized from their thinner ventral fins and egg spot. Crowntail bettas are named after their unique looking caudal fin, which resembles the spiked appearance of a crown. While they are not as popular as veil tail or halfmoon bettas, you should usually be able to find both the long finned and plakat varieties without much trouble. If the extremely crowned appearance of a regular crowntail betta is a bit too much for you, you can also try looking into combtail bettas. While not as easy to find as crowntails, their fins are much less spiked but still have a slightly comb-shaped appearance that really makes them stand out! Double tail bettas have a caudal fin that is split in the middle, causing them to have two tail lobes instead of just one. Both ‘tails’ should be symmetrical and of the same size and form a circle together when the fish flares. All other betta tail types can appear as a double tail, which means there are plakat, veil tail, crowntail and many other types of double tails. Unfortunately, though, double tails are not the most popular tail type and may be a little hard to find locally. If you’re able to go to a betta show or a betta breeder/importer you may come across them, though, and they are almost always available online on sites such as Aquabid. Though similar to halfmoon bettas, delta tail and super delta tail bettas have a caudal fin that doesn’t spread to a full half moon. Super deltas do get close to the 180° spread, but never actually reach it. Because it’s very difficult to breed true halfmoon bettas, halfmoon breeders often end up with a large percentage of delta tails in their spawns. Delta tails may therefore be a bit cheaper than actual halfmoons and not too difficult to find in local pet- and aquarium stores. They’re not any less beautiful than their full halfmoon cousins, though, and a great choice if you don’t care about the 180° spread. 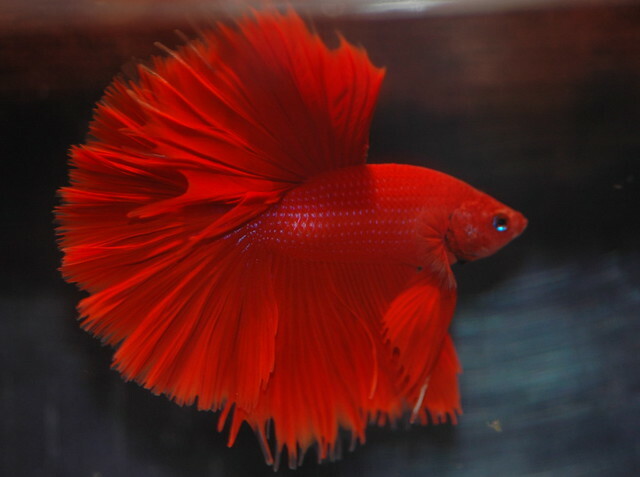 Rosetail and feathertail bettas are a recent development in betta tail types that have resulted from the search for a perfect halfmoon betta. Their fins have excessive branching, causing a rose- or featherlike appearance. While this often makes for a beautiful fish, there are a few major downsides to this tail type. The fish you see in videos and photos are often still very young and haven’t encountered any problems yet. Once they get older, they may constantly be bothered by the excessive finnage and rest most of the time. They may also start showing signs of collapsing fins or broken fin branches and even bite off their long fins in frustration, leaving them vulnerable to disease. Rosetails and feathertails are becoming increasingly popular but I would not recommend supporting the breeding of these extreme fin types. 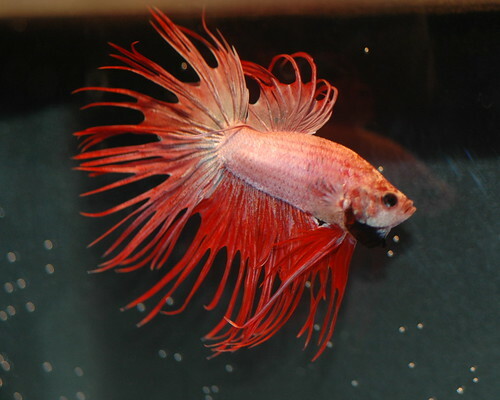 For more information, check out rosetail betta – the downside of beauty. Technically not a tail type – they can appear with almost any tail shape – dumbo bettas are distinguished from their enlarged pectoral fins. When viewed from the front, these large fins can look just like the ears of an elephant, resulting in their name. 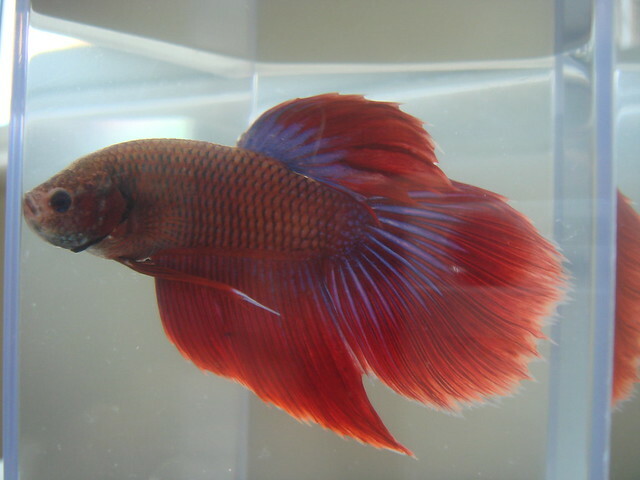 Dumbo bettas are a rather recent development, and like rosetails and feathertails can have a few problems when bred irresponsibly. Because the enlarged pectorals can already be very difficult to swim with, it’s not a good idea to go for a dumbo betta that also has a very large tail. It will be too difficult for the fish to move around with all that finnage, resulting in stress and possible disease and biting. Take your time to find someone who breeds dumbos with shorter tails without excessive branching if you really want to buy one! Dumbo betta in an aquarium store. The popular tail types mentioned above are by no means an exhaustive list. There are some other tail types that are ‘forgotten’, not very popular or in an experimental stage. To obtain them, you’ll usually have to visit a betta show or buy your fish online. Spade tail bettas, usually plakats or veil tails, lend their name from their pointed tail shape. The one pictured below is a plakat I saw at the 2013 Interkoi Show. Round tail bettas look similar to delta tails but have a much rounder tail shape that almost resembles a perfect oval. I have never actually seen one myself but with some research you may be able to find one! Half sun bettas are similar to combtail bettas but are produced by crossing halfmoons and crowntails. Part of the spawn will be very striking halfmoon fish with slight crowning in the fins. Although there are many gorgeous Betta fish tail types on the market and it’s easy to impulse buy, always think of the wellbeing of the fish first. Try to buy from responsible (hobbyist) breeders and don’t go for extreme varieties or sacrifice proper body shape for tail type. By buying responsibly, you’ll be able to enjoy your betta for a much longer time without having to deal with the possibility of stress related disease, swim bladder issues or fin biting. I will personally only be going for plakat bettas as they seem to be most comfortable with their finnage! If you have any more questions about bettas and their different tail types or if you want to share your experiences with a certain tail type, feel free to leave a comment below. Happy betta keeping! I was just wondering if anyone would be able to help me identify my betta fish. I bought him at a pet store and he was marked as a half moon. His tail was that of a half moon I believe but then again I never see him flare. It could’ve very well been a delta tail although with the two pictures shown in the article it was closer to the half moon. After he got fin rot his tail never grew back the same so you can’t tell anymore. 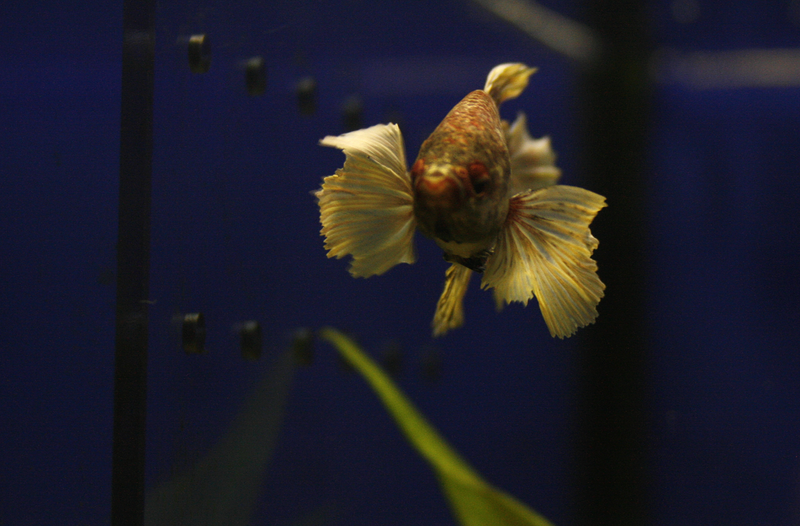 His right pectoral fin is that of a regular betta but his left is that of a dumbo betta. Is it just coincidence or is he a cross bred? And will this cause problems for him? I’ve had him for about 6 months now and he’s been good so far besides the fin rot that happened maybe two months after I got him. Almost all bettas from pet stores are cross bred “mutts” so it can be hard to tell. If you’ve never seen him flare and can’t tell any more I don’t think there’s a way to find out, but that shouldn’t matter too much. As long as you don’t see him struggle or anything there’s nothing to worry about 🙂 you could send a photo to aquariadise(a)gmail.com so I can have a look! I enjoy this post a lot especially now that I’m into betta fish – just bought a Black Dragon Plakat. Love seeing him swimming around in his new tank. I never thought of the damage to the fish those long fins may accrue. I might be interested in more wild type, were I to desire a betta. It’s something most aquarists don’t think about, but once you start paying attention to it you’ll automatically stray away from long-finned bettas. If I ever get another one it will be a plakat or wild types as well.